1.1 ITTF Laws of Table Tennis and ITTF Regulations for International Competitions (latest edition) will be applied, although the Rules and Regulations for the World Veterans Championships shall take priority. Players` Regulations – between Organizer and Players – to be included into the Invitation Program and on the Announcement Boards. 2.1 All individuals who are older than 40 years of age or who will be 40 years of age in the year of the WVC are eligible to participate. 2.2 Upon the request of the organizers, the participants shall present their passport/ID Cards as proof of age. 3.3 In the event of less than four players entering any one event, the WVC Committee has the right to either cancel the said event, or introduce a reasonable alternative for all concerned. 3.4 Every entered player is allowed to participate in one singles and one doubles event. A player must participate in her/his own age category, except in doubles. If players of a pair do not belong to the same age group, then they shall be placed in the category of the younger player. 3.5 If the doubles partner (according to the draw) is not present a new partner will be given by the organizer if possible. 3.6 A doubles pair shall not be altered if both players are present and fit to play. However, injury, illness or the absence of one player may be accepted as justification for an alteration to take place, but only before the announced “deadline”. 3.7 All entries in singles and doubles will be published on the website immediately after the deadline. Players are responsible for checking their respective entries or to ask for a confirmation from the organizer within the next 4 weeks. No alterations or new entries will be accepted after deadline. A player entering a doubles event without a doubles partner (partner wanted) must accept any doubles partner assigned to him by the organizers. Doubles pairs which are confirmed from both players or which are combined by the organizers may not be altered by a player (such a pairing may only be changed if one of its players has cancelled her/his participation in the competition). A list of pairs entered in the doubles event – confirmed by both players – will be published on the internet as soon as possible. Will be published on the internet (not later than 4 weeks after the deadline of the extended Entry Date). The players on this second list are allowed to request (or arrange) a doubles partner themselves up until the defined “deadline” – usually 5 to 7 days before the start of the accreditation at the venue. Both players of a newly formed doubles pair shall confirm this pair immediately. 5.1 The World Veteran Championships in Table Tennis is an official competition supervised by the Swaythling Club International (SCI) and approved by the ITTF. 5.2 The organizer of the World Veteran Championships (WVC) is the Nouvelle-Aquitaine Table Tennis Association (LNATT), under the supervision of the French Table Tennis Association (FFTT). 5.3 The Championships will be held from the 8 June 2020 through 14 June 2020 at Velodrome and Exhibition Center of Bordeaux. On the opening day, the competition will begin at 09.00 hrs local time. The Qualifying Competition will be played in groups (all play all). A group of four is preferred (according to the entries). The first and second placed will play in the World Championships Competition proper, the third and fourth (or if more than 4 in a group, according to the entries) placed will play in the Consolation Competition – only if they so wish and only if they mark this on the score sheet immediately after play in their group has finished. 6.1.3 In the event of less than 6 players or pairs entered in one age category the WVC Committee may decide to play a “Round Robin” in only one group. The exact system is to be published before the start of the Competition. 6.1.4 If there are two or more players in a group from the same National Association, it is essential that these matches be the first to be played. The World Championships Competition proper will be played according to the knock-out system. The Consolation Competition will be played according to the knock-out system. 6.2.1 Two match points shall be awarded for a win, 1 for a loss in a played match, and 0 for a loss in an un-played match. 6.2.2 The ranking order shall be determined primarily by the number of match points gained. 6.2.3 If two or more members of the group have gained the same number of match points, their relative positions shall be determined only by the results of the matches between them, by considering successively the numbers of match points, as far as is necessary to resolve the order. 6.2.4 If at any step in the calculations the position of one or more members of the group have been determined while the others are still equal, the results of the matches in which those members took part shall be excluded from any further calculations needed to resolve the equalities in accordance with the above procedure. 6.2.5 If it is not possible to resolve equalities by means of the above procedure the relative positions shall be decided by lots made by the Referee. 6.2.6 It is strongly recommended that a free day be considered, if at all possible, to allow for social activities and sightseeing. 7.1 The draw for the Qualifying Competition in Singles will take place approx 14 days before the beginning of the World Veteran Championships. 7.2 The draw for the World Championship Competitions and Consolation Competitions will take place immediately after completion of each age category’s qualification matches in the Qualifying Competition. 7.3 For any changes or additions to the draw, the organizer is required to obtain the approval of the Referee. 8.1 The organizer will provide local and foreign umpires for the World Championships Competition and the final stages of the Consolation Competition. 8.2 In the group play, members of the groups not playing shall make themselves available as umpires. 8.3 In the Consolation Competition, the loser of the match shall be umpire in the next match at the table where he or she played. 9.1 ITTF approved tables, surrounds, nets and balls will be used. 9.2 One side of a racket must be bright red and the other black. 9.3 Racket covering must be ITTF approved. 10.1 The size of the court will be a minimum of 10 m x 5 m.
10.2 Access to a designated area for the attachment of racket coverings must be provided. Liquid adhesives shall not be used elsewhere in the playing venue. 11.1 Players are responsible for their physical and mental fitness to compete in the Championships. It is recommended that a routine check-up ahead of the WVC should be carried out by a doctor. Any necessary health and accident insurance policies must be taken out by the players themselves. 11.2 Players accept the ITTF Anti-Doping Rules (according to the ITTF Handbook) as a condition of participation. It is recommended that in the event of a player being prescribed specific medication in connection with his general health from his doctor, the said player must obtain the necessary written confirmation from his doctor. In the event of a violation of these rules, the WVC Committee will decide about any sanctions. 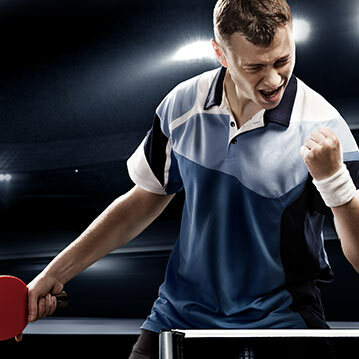 11.3 Players may use only approved and authorized equipment according to the valid list provided on the ITTF website. 11.4 Players must accept the ITTF Racket Control Regulations (according to the ITTF Handbook) as condition of participation. In the event of a violation of these regulations, the referee will decide about any sanctions. 11.5 Each player is obliged to compete at the table and time set by the “Competition Schedule”. The player is responsible for keeping her/himself informed when and where to play. Any player who fails to appear at the scheduled time will automatically lose the match, after a 5 minutes waiting period. 11.6 All players must sign the result of the score sheet after the match, before leaving the table. 11.7 During the competition players will be required to carry with them their entry numbers – said entry numbers to be attached to their sports shirt on their back whilst playing. 11.8 The organizers accept that no restrictions should be made with regard to “drinking water” in the duration of a match. However, drinking water will only be specifically allowed at the same time as the “towelling down regulation”. 11.9 No advertisement for alcoholic drinks and tobacco shall be worn by the players in the playing halls. 11.10 Only the members of the respective group/individual match played at that table and one coach per player/pair (two coaches for doubles containing two associations) are allowed to enter the playing area. All other players/spectators not playing in the respective group/individual match have to be outside of the playing area (stands/spectators area). 12.1 Each player is entitled to a 5 minutes rest between two matches, or at the Table Manager`s discretion. 13.1 Appeals will be dealt with by a three-member Jury composed of a member of the SCI/WVC Committee, a representative of the Organizing Committee and a member of the SCI Executive Committee. The Referee or his/her deputy will have the right to speak, but not to vote. This must be publicly displayed in the playing hall (in the same area where the results are published) on the official Tournament Board. Protests can be lodged against the decision of the referee only and they have to be submitted in writing to the Organizing Committee immediately after the completion of the match. No member of the Jury can take part in the tournament. 14.1 To be decided upon by SCI/WVC Committee together with the organizers. 14.2 The top four players and pairs in each category of the World Championships Competition will be presented with medals. The winners will also be presented with a special trophy from the Swaythling Club International. 14.3 Winners and runners-up of the Consolation Competition will receive a certificate and souvenir, which will be handed over at the table immediately after the final match. 14.4 If an event is constituted by a single group, only the first three will be rewarded with medals. 14.5 All participants will be awarded a Championship Diploma.